Buy The World A Hope asks Coke to spend its annual $3 billion advertising budget for good. At first glance this plea seems like the fanciful daydreaming of a socially minded if naive group of well meaning world citizens, but I believe there is much more at play here. In 1971, Coca-Cola released its first global ad, “Buy the World a Coke,” which became one of the most successful ads in history. Sung by a group of teenagers on the top of a hill, the ad evoked positive feelings of love and togetherness. The recently launched website called Buy The World A Hope aims to galvanize a social movement of letter writing to the CEO of Coca-Cola, urging the company to re-channel it’s $3 billion advertising budget for one year and direct that money toward protecting rainforests. 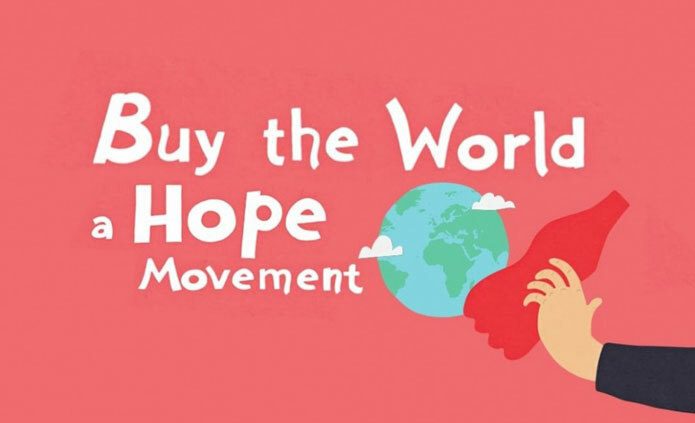 The Buy the World a Hope website is already available in 15 languages and seeks to leverage Coca-Cola’s brand vision for 2020 to join business and planet. The Buy the World a Hope campaign raises the bar by challenging Coke to truly live up to this vision by “putting their money where their vision is” and lend a hand in assisting world land trusts to preserve rainforests. There are two significant consumer trends at play here that provide the opportunity for Coke to take the lead and in so-doing grow their brand engagement and bottom line significantly. The first trend is Consumer brand empowerment – or the ongoing movement of consumers taking ownership of the brand they love most. This movement has always challenged brands who on the most part are failing to get the balance between corporate brand ownership and shared brand stewardship wrong. Yet here’s an opportunity for Coke to hand the reigns of the brand’s marketing budget over to social good, requiring a giant sized gesture of trust. The second trend is Consumer connection to brands who genuinely demonstrate a desire to do good things. According to Edelman Good Purpose Research, 83 percent of global consumers say their buying habits change if that brand makes the world a better place. That statistic, partnered with the fact that meaningful brands beat the stock market by 120 percent provides a sound business basis for Coke to consider this strategy. Would this zag in brand strategy come with risks for Coke? Hell yeah, every ounce of marketing experience at Coke would be telling them that without the global blanket of consumer advertising they are opening the door for Pepsi and the swag of other regional competitors to swing-in and swipe market share. The correlation between marketing spend and product sales in each of their markets is a well established ‘known’ whereby the correlation between good-will equating to increased sales and meaningfulness equating to increased stock price is clearly an ‘unknown’. However, in a marketing space filled with brands all trying to stand-out and build consumer connection, the largest brands need to be making the biggest plays, and Coke might just have been handed permission for the most significant play of their brand’s life.